Be sure to check out the updates to this post HERE. More material was added to this post Nov 1, 2012 and Feb 20, 2014. 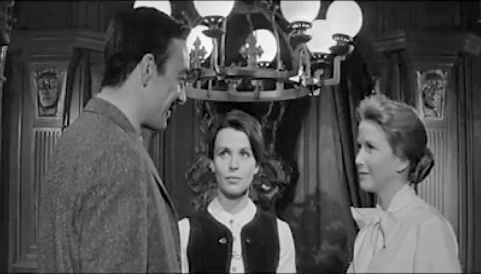 When discussing the influences that stimulated this or that element in the Mansion, it would be a mistake to overlook the movies. 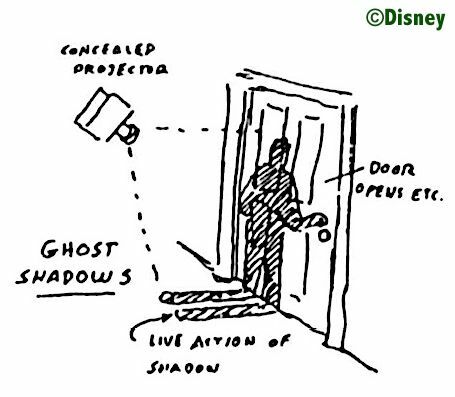 By their own testimony, the Imagineers watched spooky films as part of their research, looking for useable ideas. Whenever this topic is raised, there are two cases that are routinely trotted out to illustrate the point, but rarely does the discussion go much further. As usual, Long-Forgottenistas demand more. We shall cast a wider net, and hopefully it will catch us some strange and interesting fish. 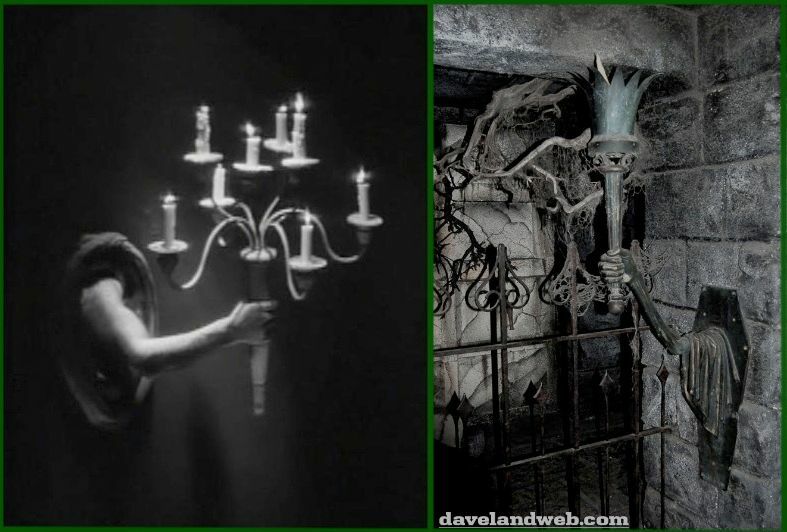 The two well-known examples are the bulging doors in the Corridor of Doors, a gag taken from Robert Wise's 1963 horror film, The Haunting, and the human-arm sconces in the crypt, inspired by Jean Cocteau's 1946 interpretation of the Beauty and the Beast story, La Belle et la Bête. The latter film in particular was (I should say "is") a favorite of Rolly Crump. administrator is willing to break down any door if it will provide further illumination. 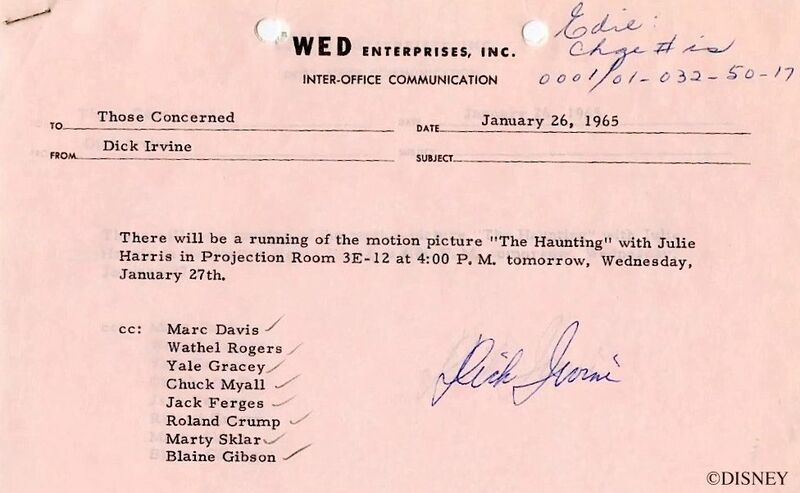 With regard to The Haunting, we know exactly when the Imagineers had a private screening and who was invited. So they had plenty of opportunity to examine the film frame by frame, if they so wished. As it turns out, the bulging door gag is only one of several elements in The Haunting that left their marks in the Corridor of Doors. 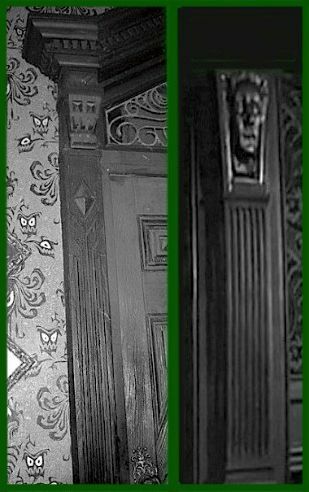 Wise doesn't provide very many full-length views of the door, but if you've got a sharp eye you'll notice that the overall design is clearly similar to the Haunted Mansion design. It's not just the bulging; the entire door is inspired by The Haunting. 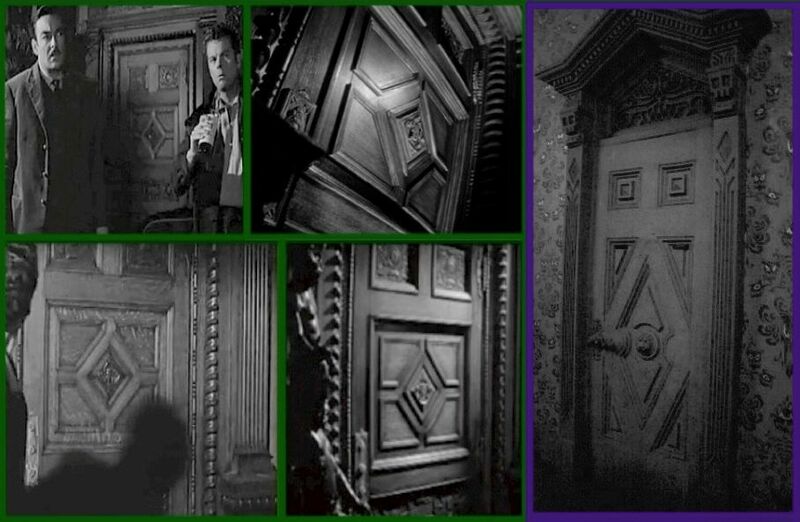 Also, it's possible that the HM door jambs, with their fluting and their stylized skulls at the top, were inspired by door jambs that appear all over the place in the main hallway in The Haunting. creepy wallpaper in The Haunting that provides one of the film's best scenes. around it, you're probably looking at multiple borrowings from various places in The Haunting. bulging in The Haunting. An almost identical sound effect was originally planned for the Corridor of Doors. of the hearth. Like other statuary in the house, the faces turn and follow Belle as she passes by. for the animated Leota tombstone at the Orlando Mansion. Maybe, maybe not. By its very nature the effect is going to produce a face that appears to follow you, so I want to be careful not to claim too much. 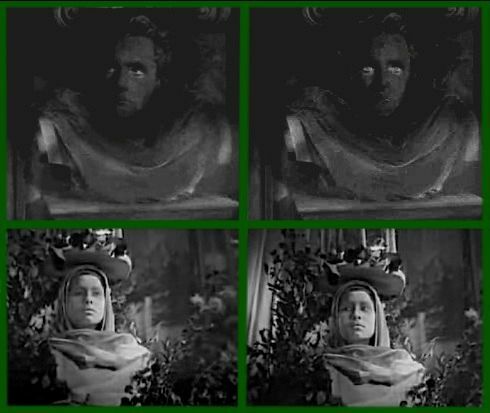 But La Belle et la Bête was a favorite of Rolly's, as already mentioned, and you can reasonably suspect that he was struck by the way this effect duplicated the eerie statuary in the Cocteau film. 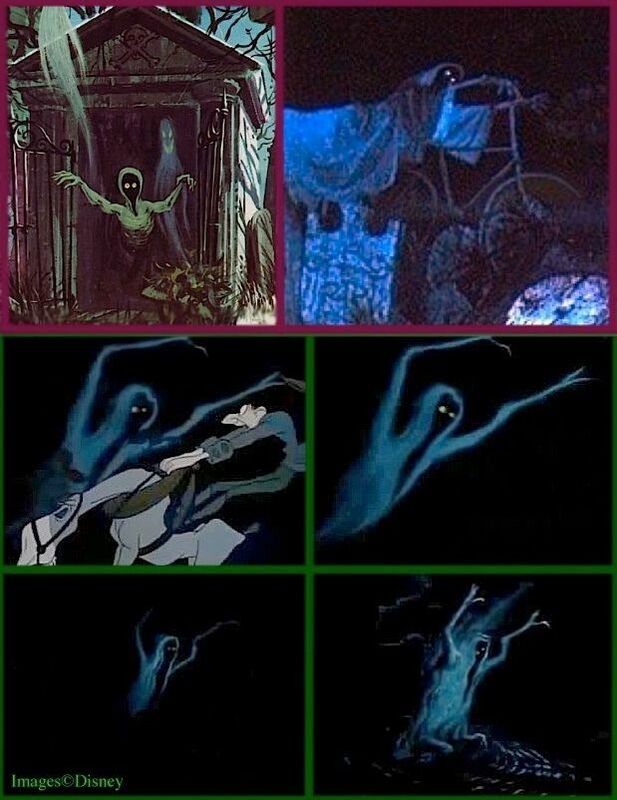 It brought some of the atmosphere of La Belle into the Haunted Mansion, something that must have pleased Mr. Crump. 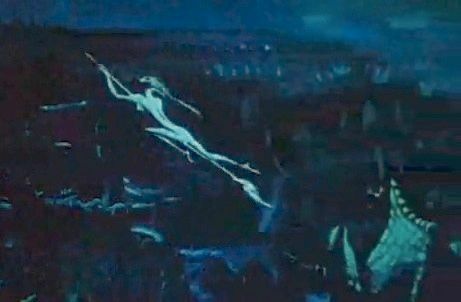 There are other films known to have influenced the Imagineers. In a previous post, we discussed an early proposed backstory for the Ghost Host, dubbed "Mr. Meaker," who had a mechanized canopy bed that smothered people with something other than affection. is taken from William Castle's 1960 schlockfest 13 Ghosts. 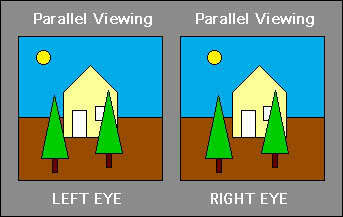 Filmed in Illusion-O!!! omnivores when it came to cinematic research. I wonder if Walt sprang for the popcorn? 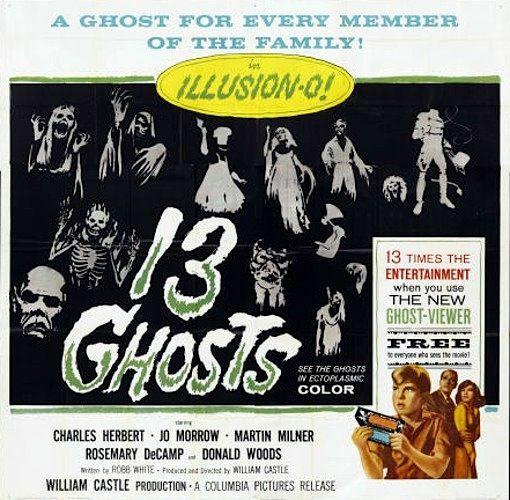 For a much fuller appreciation of 13 Ghosts, see now HERE. One area generally missed in these surveys is the Imagineers' apparent penchant for 1920's era horror films, films from different parts of the world. 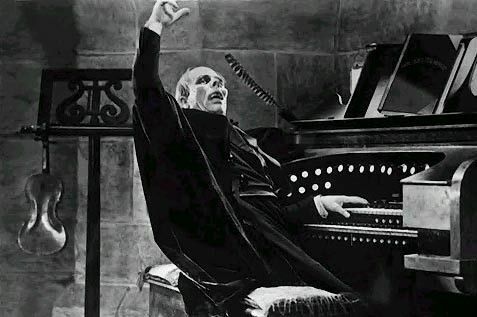 Lest we overlook the obvious, the Mansion organist, like any phantom organist, probably owes his very existence to Lon Chaney in the classic Phantom of the Opera (1925). 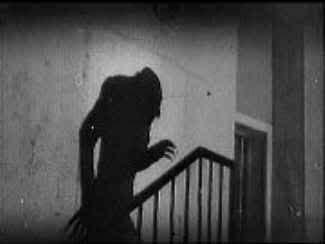 From Hollywood we go to Germany, and F. W. Murnau's 1922 classic, Nosferatu. 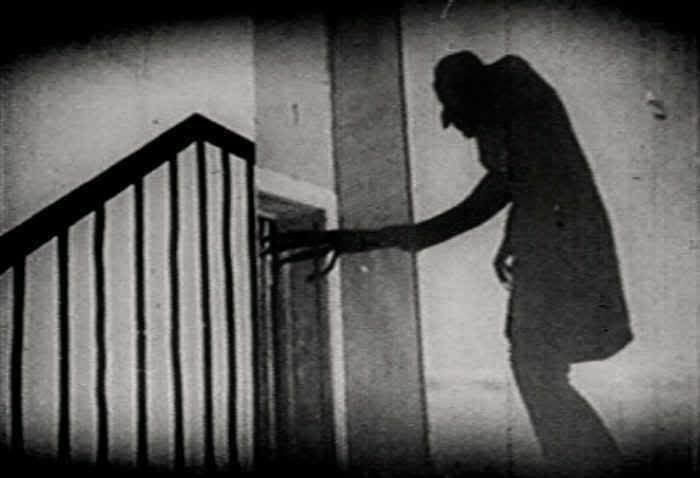 A favorite gimmick throughout this first film adaptation of Dracula is to treat Nosferatu's shadow as something dangerous and substantial, emphasizing, I suppose, his unreal existence between the lands of the dead and the living. 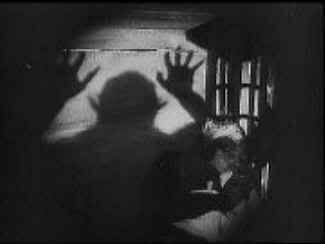 In particular, the shadow of his hands is used a number of times to good effect. 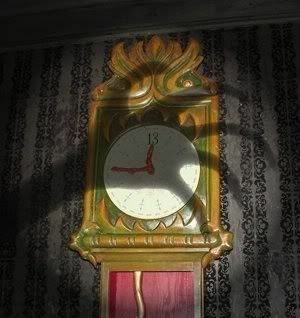 I have argued previously that the claw-like shadow of a descending hand, in the Clock Hall, is really the climax of Act One in the three-act play of the Mansion. It's the closest thing to an actual attack on you in the whole ride. I suspect that this thematically important gag was inspired at least in part by a scene in Nosferatu, proving, I guess, that shadows can be more dangerous than they look. From Germany, let us go north to Sweden. In that same year, 1922, a remarkable documentary film premiered, Benjamin Christensen's Häxan: Witchcraft Through the Ages. 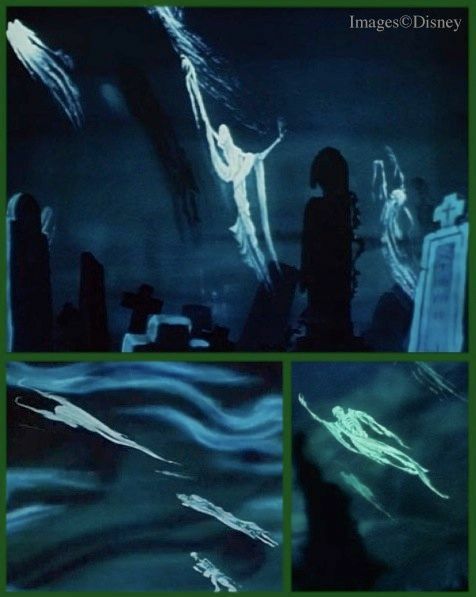 One scene depicting the departure of witches for the Sabbat is very obviously a major inspiration for the similar scene in the "Night on Bald Mountain" sequence of Disney's Fantasia. 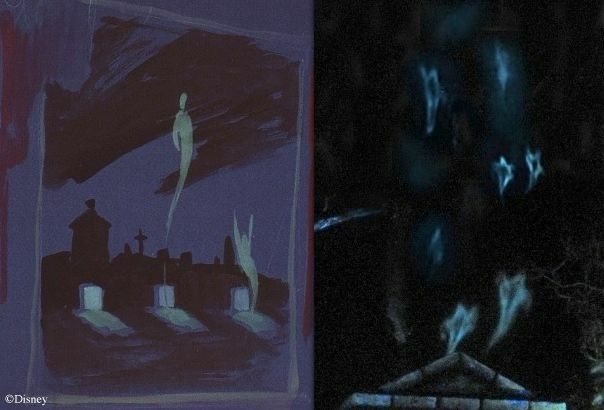 Mansions, as you can see from concept art for Phantom Manor. and these seem to have migrated through Ken Anderson's imagination and into the final ride. 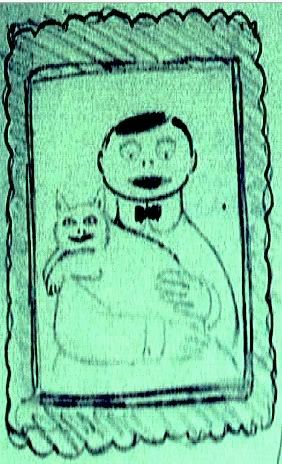 pedigree, winding their way through Fantasia in 1940 to Häxan in 1922. 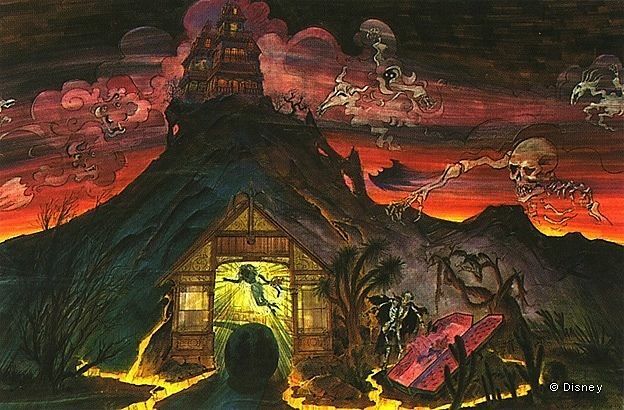 "Bald Mountain" was one of three in-house, Disney films that were heavily referenced as the various Imagineers brainstormed the future Haunted Mansion during the 50's and early 60's. 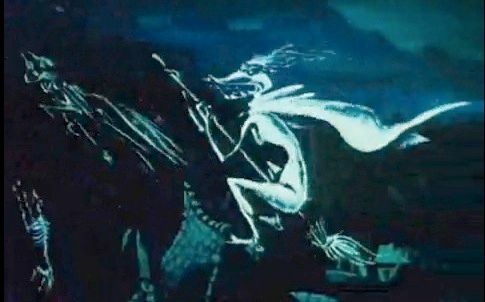 The other two were The Adventures of Ichabod and Mr. Toad, with its famous Headless Horseman sequence, and a 1937 Mickey Mouse short, Lonesome Ghosts. 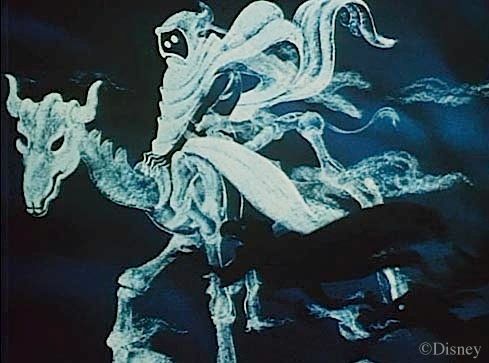 Ken Anderson, of course, had a whole script worked out that would incorporate the Headless Horseman directly into the HM, as many of you already know. That came to nothing, but that doesn't mean that incidental details from Ichabod didn't find their way into the finished Mansion. The style of wraith found below is pretty generic, but the detailed correspondence to Collin Campbell's artwork and to the bikers in the attraction is certainly suggestive. Lonesome Ghosts also gave Ken Anderson ideas. 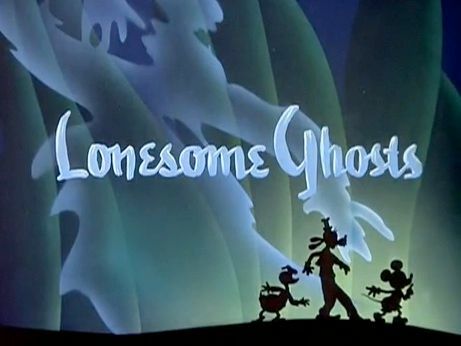 He was going to incorporate a friendly ghost with that very name, "Lonesome Ghost," as a sort of host alongside the human tour guide during the walk-thru. Didn't happen, of course, but a more substantial contribution from LG is the very idea of prankish, fun-loving ghosts turning a haunted house into their personal playground, scaring human interlopers just for amusement, and no harm done. 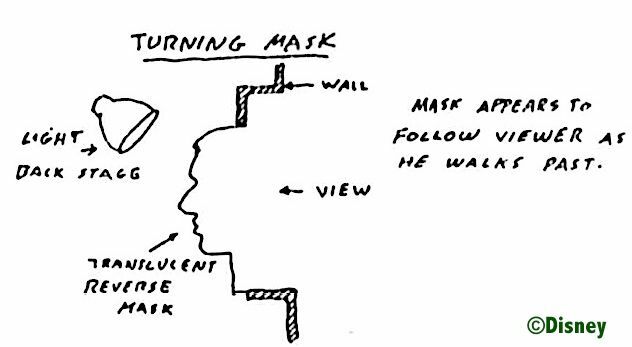 If you look at it that way, this little cartoon foreshadows the Mansion more fully than any other film. Gorsh. 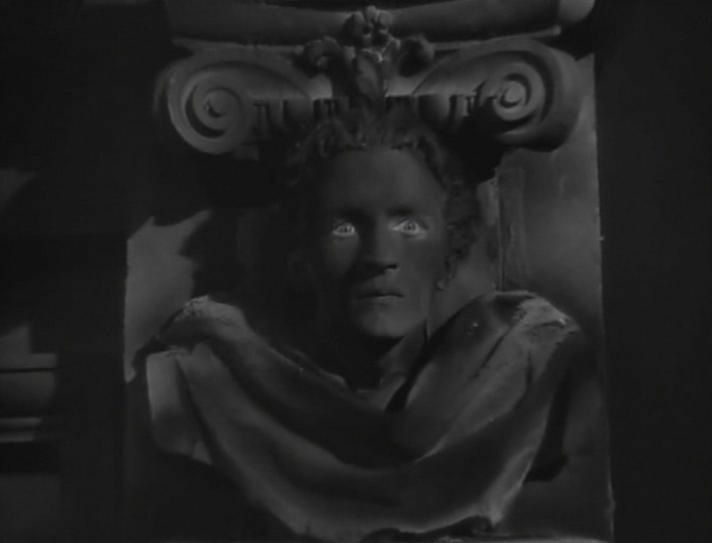 Cocteau's Beauty and the Beast is a phenomenal film... Artistically stunning with a Gustave Dore-like richness to the set and atmosphere. And it has probably the sweetest introduction of any film ever made. If you like old movies about ghosts and ghoulies, I highly recommend the 1931 film Vampyr. I doubt it had any influence on the Mansion, but it's a shockingly well-done, unnerving film of genuine Gothic horror. 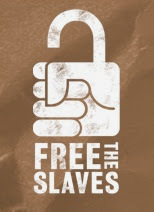 Just discovered your blog and all I can say is "Wow!" 1) Someone else (possibly DisneyAndMore.blogspot) noted that promotional photos for Hush, Hush Sweet Charlotte feature actress Olivia De Havilland perched like a proper lady on the top of a tombstone... very much like one of the stretching gallery paintings. 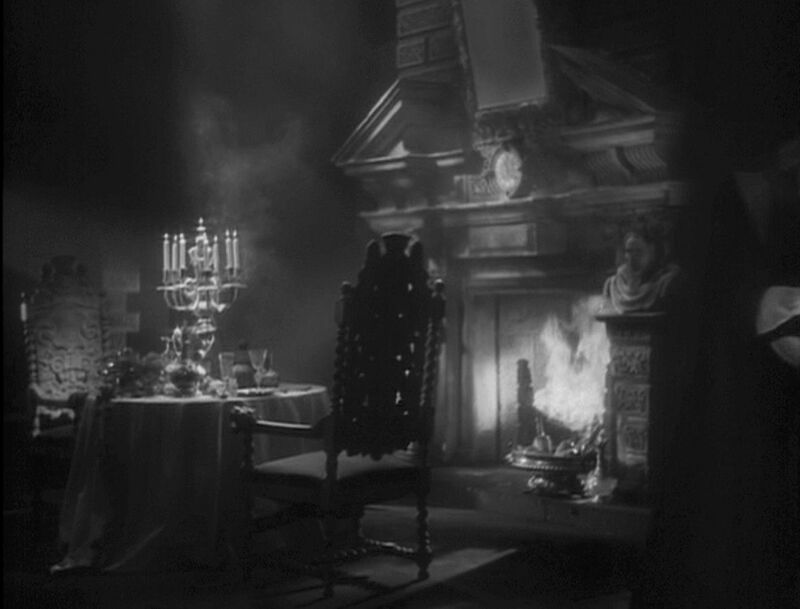 2) The film Great Expectations (1946) features a long dining table, next to a large fireplace, and a cobwebbed covered wedding cake. 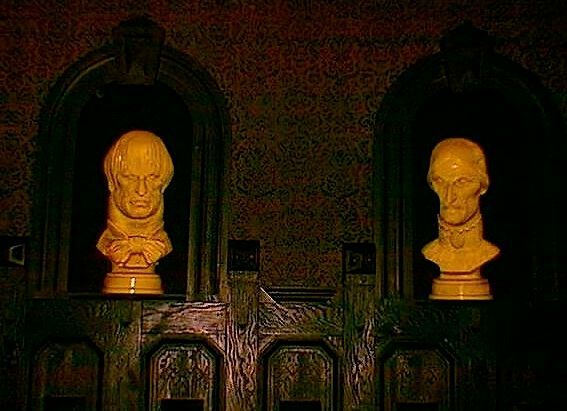 You couldn't help but notice a similarity to the Mansion's great hall! 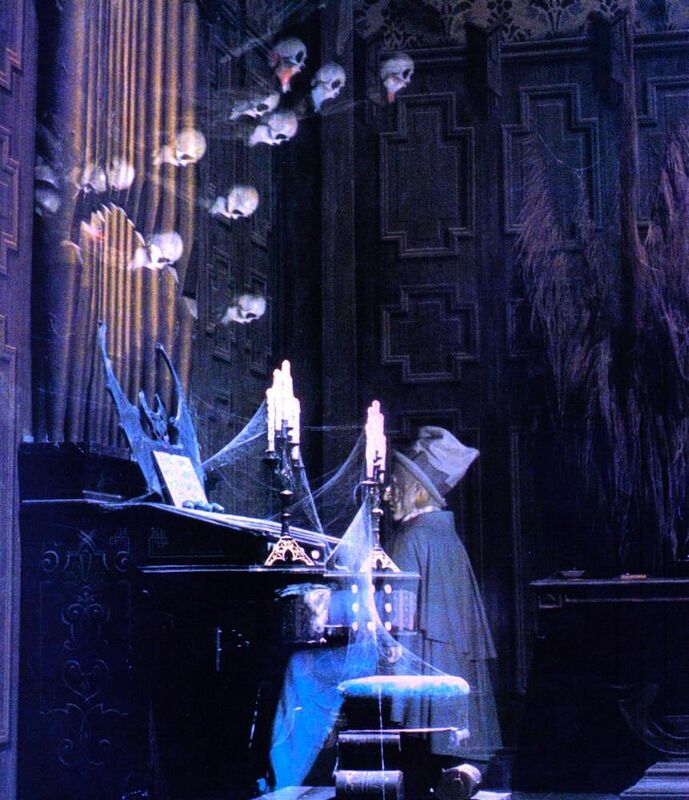 3) Alfred Hitchcock's book Ghostly Gallery (1962)... well obviously the phrase "ghostly gallery", but also the fact that the introduction to that book is in the first person, in the character of a "Ghost Host", and the very first words he speaks? "Good Evening." Loving this blog. I have heard the the Bob Hope film GhostBreakers played some inspiration as well. That is my favorite movie ever so it’s nice to think it would be a source of inspiration for the imagineers. The Other "Nine Old Men"